I was invited to a very special event for the Mt. Washington Tavern. It was the grand opening of the new Mt. Washington Tavern! I was so excited when I heard that they had built a second tavern on the exact same site that it burned down and had the grilled cheese competition that I judged! They even used some of the walls that didn't crumble! When I got there, they were giving a tour for the other guests, and they showed us the improvements that they did to it. They had a bar on the 1st floor, and even saved the old shuffle board! On the second floor they had 2 rooms for the older, richer couples, a cocktail bar, and lots of horse racing stuff, like a 5 ft x 10 ft replica of Pimlico's the Old Hilltop. They also have a new SkyBar and elevator. The items on the menu that I could try were Mini Crab Cakes, Beef Carpaccinio Flatbread, and Rare Seared Ahi Tuna. I had some pieces of Saltimbocca, a couple of Bacon wrapped Scallops, a few pieces of cheese from the cheese platter, and a bar made Cherry Coke! The bar made Cherry Coke was awesome! It had all the textures and fizziness of a regular soda, but without all the packaged and artificial taste. The Scallops were pretty good, too. The scallops had a seafood taste, not that strong, yet it's strong enough that you can taste it. That and the bacon made a great combination. Yet, of course, my brother disagreed. "I didn't really like the texture of it," Owen said. The Saltimbocca was delicious! It was cheesy, and had lot's of meat flavor. My brother quotes "I really liked this because the cheese was cheesy, the ham was juicy, and the chicken had lots of taste." The cheese platter was also really good. They had different types of cheese, and all of them had the qualities of cheese, creaminess and a different flavor. I give **** stars for food and **** stars for kid friendly. I give 4 stars for kid friendliness because they had a shuffleboard, Television's, and some kid friendly items. I think that this place will be a even bigger hit than last time, and I hope that they have another grilled cheese competition so I can judge it again! Well, that's all. Bye! I was invited to a place called Gordon Biersch in Baltimore for a special event. The event was an opening preview in that they were trying to see how people would like their food and how they could change the way they cooked things before they opened. When I got there, they were very busy, but we had already reserved our seats, so we didn't need to wait too long. When I got seated, I saw that they had lots of TV's all over the place. 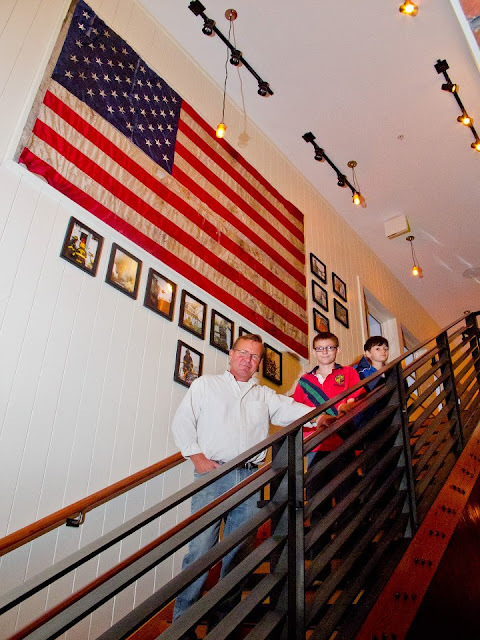 I saw on their menu they had items like New York Strip & Grilled Shrimp, Steak Frites, and Beer Battered Fish & Chips. They also had a kid's menu, which had Macaroni & Cheese, Pizza, and Pasta. They didn't have everything on their menu for the event but I got BBQ Chicken Pizza from the regular menu, my brother got the Cheese Pizza from the kid's menu, and my sister got the Macaroni & Cheese from the kid's menu. While we waited, we got some Garlic Fries, which were a twist on Garlic Bread, my mom and dad got to try some of their home made beers, and my sister, brother, and I got homemade root beer. The root beer tasted out of this world! My BBQ Chicken Pizza wasn't actually as good as I thought it would be. It had so much BBQ sauce, it was actually pretty spicy. Though my brother thought differently. 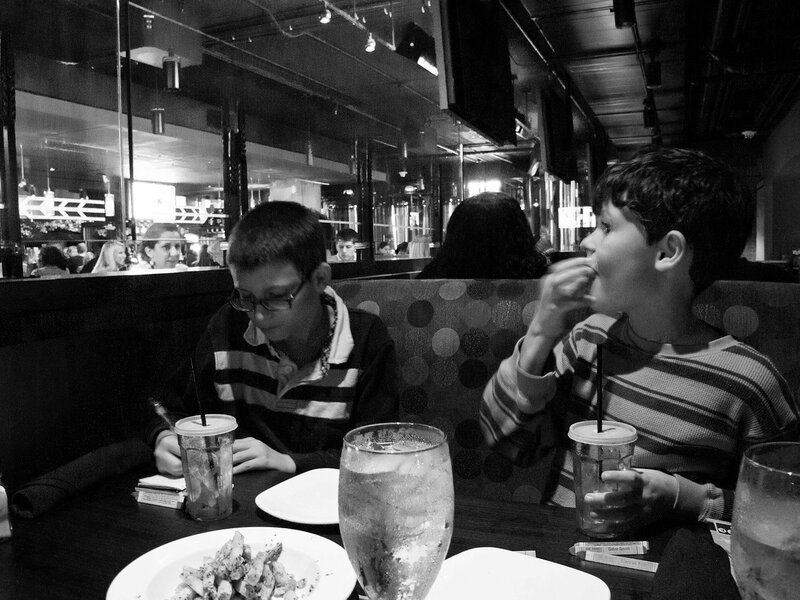 Owen quotes" my Pizza was really good." And for dessert, everyone got a brownie sundae to split. I give them **** stars for kid friendliness and *** stars for food. I really hope to come here again, since this wasn't their complete menu. 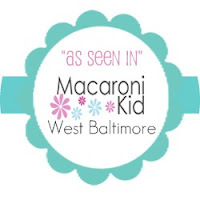 Also Adventures of a Koodie was nominated again this year as Best Food Blog for the Baltimore Sun contest - The Mobbies! Please vote everyday through November 9 at 5pm. Don't forget to send those votes! Last year I got in 4th place. Click here to vote! Well, that's all. Bye!